A thin pane of glass can be bad news for many of our songbirds. Trees and other vegetation reflected in a glass window can confused birds, leading to window strikes. When startled, birds instinctively take flight for the nearest cover. If a window fools them, they may fly toward perceived shelter only to collide with the unforgiving glass. 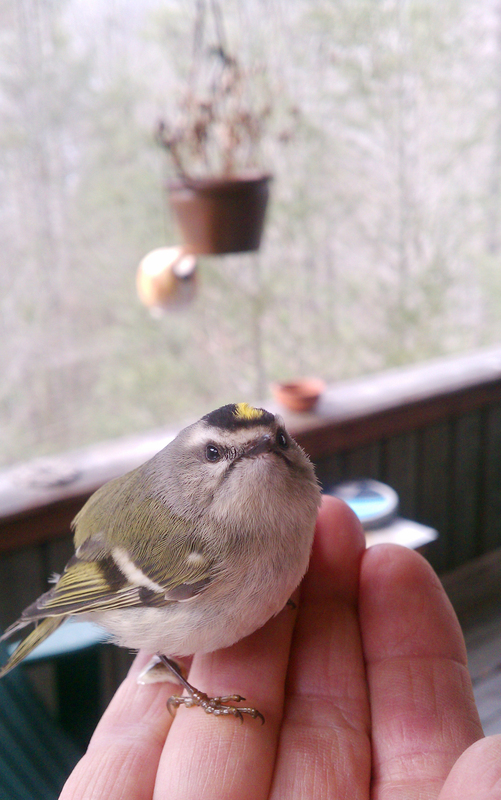 This Golden-crowned Kinglet recovered after a collision with a window. Not all birds are so lucky after striking windows, which they have difficulty seeing. That’s apparently what happened last week at the home of one of my neighbors. According to some estimates, millions of birds perish each year from window strikes. At least the story I’m sharing this week has a happy ending. I received an email and photo this past week from my Simerly Creek neighbor, Beth McPherson. Beth and her husband, Steve, have a wonderful home on Simerly Creek Road in Hampton. Surrounded by woodlands, their home is like a magnet for a variety of birds. “I have another simple bird for you to identify,” Beth wrote in her email. She explained that the bird ran into a window at her home. Fortunately, after a brief rest on her upper porch, the bird recovered completely from its impact with the window. She described the bird as not much bigger than a hummingbird and estimated that the bird was 3 inches long and about 1.5 inches wide. “Is it a warbler?” Beth asked. Actually, although warbler was a good guess, Beth’s bird was a member of a family of tiny birds known as kinglets and firecrests. Her bird turned out to be a Golden-crowned Kinglet, a fairly common winter visitor. All the large hemlock trees on Beth’s property are probably very attractive to visiting kinglets. There are two types of kinglets present in Northeast Tennessee, including the Golden-crowned Kinglet and the Ruby-crowned Kinglet. They are indeed very tiny birds, as well as extremely active ones. They are also the only member of this family of birds found in North America. Four other species, however, are native to Europe, Asia and North Africa. The remaining species include Goldcrest, Common Firecrest, Madeira Firecrest and Flamecrest, which is also known as the Taiwan Firecrest. It was significant that Beth compared the small size of the kinglet that hit her window to hummingbirds, which are probably the only birds that are smaller than kinglets. The kinglets belong to the family, Regulidae, and the genus, Regulus. The family and genus names are derived from a Latin word, regulus, which means “rex,” or “king.” The name was apparently inspired by the colorful crown patches, often red, orange or gold, that resembled the royal “crowns” of kings. Although similar in size and overall coloration, the Ruby-crowned and Golden-crowned Kinglets are easily distinguished from each other. Side by side, the two species of North American Kinglets are easy to distinguish. The Golden-crowned Kinglet has a striped facial pattern formed by bold black and white stripes. The Ruby-crowned Kinglet, on the other hand, has a bold white eye ring but not striping. The Golden-crowned Kinglet has an orange crown patch, while the Ruby-crowned Kinglet has a red crown patch that is, more often than not, kept concealed. Kinglets are active birds, foraging vigorously for small insects, and spiders. When foraging, both kinglet species have a habit of flicking their wings over the backs. Even if you can’t get a good look at the birds, this behavior helps contrast them from other small birds. Golden-crowned Kinglets are widespread in the region during the winter. During the summer months, head to the slopes of Roan Mountain to look for these tiny birds that nest in the higher elevations of the Appalachian Mountains. I enjoyed receiving the email from Beth. I would love to hear from other readers, too. Just post comments on my new blog at ourfinefeatheredfriends.wordpress.com. You can also reach me on Facebook or send email to ahoodedwarbler@aol.com. Please share the link to the blog with others who might be interested in the topic of birds and birding in Northeast Tennessee. This entry was posted in Birding, Birds, Uncategorized and tagged Birds colliding with windows, Elizabethton Star, Golden-crowned Kinglet, Kinglets, Ruby-crowned Kinglet, The Erwin Record, Window strikes on February 23, 2014 by Bryan Stevens. Glad we as readers can still view your column.